Herbaceous wild tarragon and garden ivy are infused with invigorating notes of Tuscan cypress and cedar. NEST Fragrances candles are made with a premium, highly refined, cosmetic-grade soft wax formulation that was developed over many years to optimize burn and fragrance diffusion. The ingredients used are the highest grade of wax materials and the finest fragrance oils available. 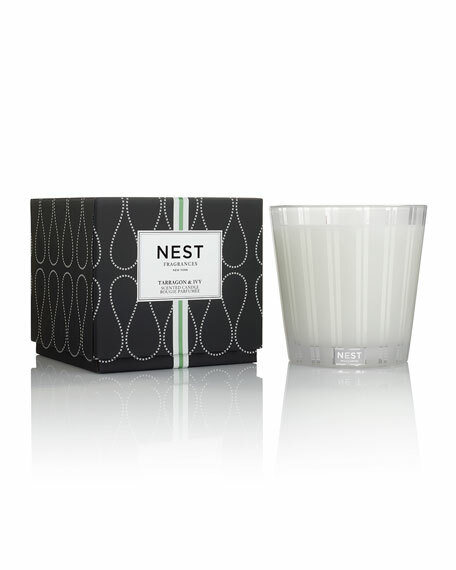 NEST Fragrances candles are well-known for infusing a room with fragrance. Approx. Burn Time: 80-100 hours. For in-store inquiries, use sku #2155339.